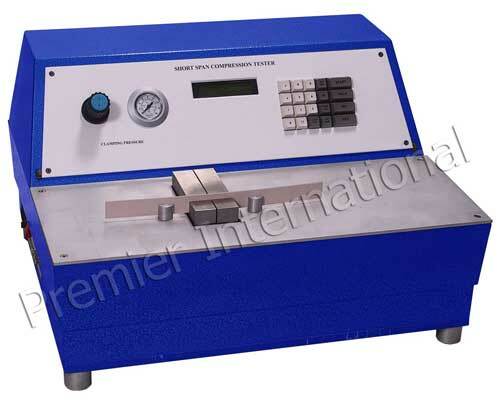 We offer Short Span Compression Tester. The compressive index of a material increases with sheet density in much the same way as the tensile index. Hence, fiber characteristics that contribute to density and flexural modulus of the sheet and the resilience of the fibers themselves are likely contributing factors. Fully microprocessor controlled menu driven software of our Short Span Compression Tester allows easy selection and setting of test parameters. Precise pneumatic clamping holds the specimen accurately and sample test to minimize human error during test to provide rapid and efficient determination of compression strength of fluting media or test liner suitable for paper and paperboard- GSM range 100-400 with in-built printer.